Please register to join the IMRC on Mar. 25th at 7:00 pm at the Balsillie School for International Affairs for a lecture and conversation with Ben Rowswell, President and Research Director of the Canadian International Council. Mr. Rowswell will draw on his observations of populism in Venezuela, the United Kingdom and the United States to argue that it represents a rival form of politics to democracy. 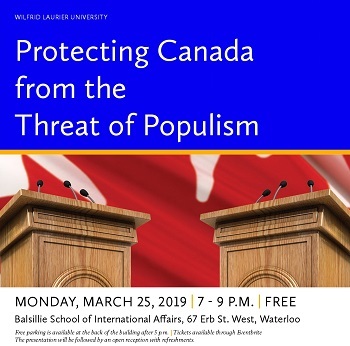 He will demonstrate how misleading and hostile perceptions of the international system are a mainstay of populist politics, and will issue a call to all Canadians to engage in informed and respectful debate about international relations as a means to uphold our democratic traditions. Alison Mountz, Director of the IMRC and Canada Research Chair in Global Migration, will moderate a conversation following the lecture. The evening will wrap up with a reception in the CIGI lobby.